When our company launched TeaTime magazine several years ago, we knew there was an audience of tea drinkers and people who loved the ceremony of tea. 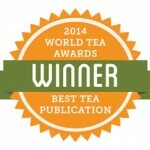 Lorna Reeves is the editor of TeaTime and has led this magazine to accept the 2014 World Tea Award for Best Tea Publication. 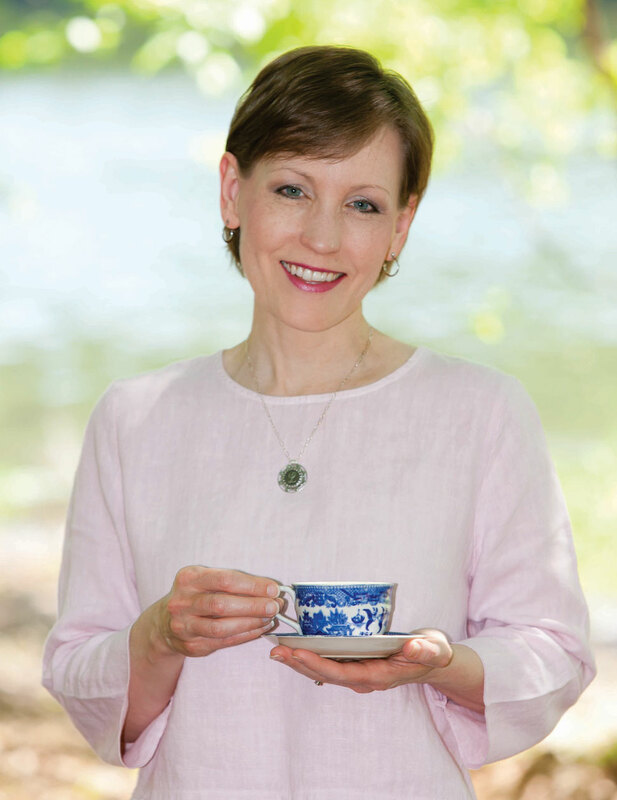 She is a leading authority on tea and a much-sought-after speaker for her knowledge of tea and the beauty of celebrating tea events. I am so excited that she is our guest blogger today and know that you will love her post. For as long as I can remember, I have enjoyed tea—that is, iced tea. It wasn’t until adulthood that I came to appreciate hot tea. That was some 20 years ago at an event Hoffman Media hosted in Williamsburg, Virginia, when I was editor of one of the needlework magazines we used to publish. While there, I had the privilege of having afternoon tea at the Williamsburg Inn. I was hooked, and became obsessed with Earl Grey tea. Then, a few years before I became editor of TeaTime magazine, I learned about the various tea types (white, green, oolong, black, and puerh) and that they require different water temperatures and steeping times. (If you don’t like green, white, or oolong tea because it tastes bitter, you might want to revisit your steeping methods. Try water at 175–190° degrees instead of boiling [212°], and infuse for no more than 3 minutes.) I couldn’t believe what I had been missing! And I continue to learn as I taste new teas and try new blends. Even when the weather is warm, I still enjoy drinking hot tea. I know that may sound odd, especially since I live in the South, where when someone says tea, they usually mean iced sweet tea. Such tea is often dark and heavily sweetened. I find that good-quality tea properly prepared rarely needs sugar, though some would argue that a touch of sweetener can enhance some flavored teas. At a recent dinner party, I served a variety of unsweetened iced teas—some flavored, some not—and told my guests that a pitcher of simple syrup was on the table for sweetening to taste. (To make simple syrup, combine equal parts hot water and sugar, stirring until sugar dissolves. Let cool before using.) I suggested they try their tea selection first to determine if sweetener was even necessary. My friend Lisa took a sip of the raspberry white tea and remarked that though she normally prefers sweet tea, that tea was so good, it didn’t need sugar. One challenge of serving iced tea (sweetened or not) is that the ice cubes can dilute the tea as they melt. In the following recipe, which has appeared in TeaTime, we found a tasty way to solve that. This iced tea is one of my new favorites because it is a fruity adaptation of my old favorite hot tea—Earl Grey. For this recipe, we freeze peach nectar in ice-cube trays. That serves as the ice, the fruit flavor, and the sweetener for the tea all in one. Give it a try! I think you’ll find it so tasty and easy, you’ll want to make it all summer long. Cheers! • Place 1 mint leaf in each section of 2 (18-well) ice-cube trays. Divide peach nectar among prepared wells of ice-cube trays, and freeze completely. • Bring cold water to a boil. • Place tea leaves in a 2-quart or larger teapot or saucepan with lid. Pour boiling water over tea leaves. Steep, covered, for 3 minutes, then strain, and pour into a heatproof container. • When ready to serve, fill glasses halfway with peach-nectar ice cubes. Pour iced tea over ice cubes to cover. Tell us: What’s your favorite type of tea? There is something magical about a hot cup of tea served in a delicate china tea cup. Tea has been my fascination for decades! Each issue of Tea Time magazine is an absolute delight to read. I’m a southern girl and love my iced tea. When dining at the Four Seasons, when they refill your iced tea, they bring ice cubes made of tea so as not to dilute the drink as the ice melts. Love! I enjoyed this post from TeaTime mag. editor and being originally from Virginia I know what she means when in the South by tea it was always ice tea. I never cared for ice tea and after coming to Canada and continually being asked whether I cared for Coffee or Tea and I would ask for water (today they would understand) everyone looked at me in a strange way. Finally I thought I know I don’t like ice tea (although here it was hot tea) I decided to try coffee and stayed with this hot drink until I became allergic to it. Then it was back to what to drink so I went for hotwater and lemon and then making new friends with a British lady who was from Wales I learned to truly enjoy tea. I also love Chinese Teas and just recently heard of Lady Earl Grey. I have loved Earl Grey Raspberry and Creme de Earl Grey is a favorite. When I discovered that Lady Earl Grey came in a lovely blue package I was sold on it as blue is my favorite colour. Would love to win a subscribtion to TeaTime Magazine as it was love at first site of knowing such a magazine existed but it is just not in my budget. 15 years ago I gave a High Tea wedding shower for one of my oldest granddaughters and it was a hit with all the ladys in attendence. I also spoke to ladies groups about tea and being a fashion colour consultant (at the time) the two were a great match. Sitting down to a nice cup of tea brings back the memories. My Scotish grandmother expected her grandchilden to be at her house for tea at 4pm daily. (If you had learnt to walk, the older ones were to bring you.) Each day my mother sent us down the country trail between our house and grandma’s. Mom stood at the dining room window and grandma would watch from her kitchen window, or meet us at the end of her vegetable garden. There would be scones and sandwiches made with home made bread. People need to slow down and enjoy what the Edwardian generation had to offer. Polite conversation of how our day has gone, what we did at school and at the same time etiquette was taught without us realizing it. My niece got married in May. Each guest had a small box of Murchie’s Wedding Blend tea wrapped in a simple ribbon and flower beside their place card. My niece went to secondhand and antique shops and purchased cups and saucers. The cups and sauces had coloured sand in them and a tea light. At the end of the evening the guest were asked to choose a cup and saucer (there were extra on a side table) and take them home. The cups and saucers went as far away as New Zealand and Australia. New memories were made. How dreamy. Thank you for sharing!! That was positively wonderful to visualize – thank you! I have not tried Earl Grey in ice tea so this sounds delicious. Earl Grey is my favorite! I enjoy my TeaTime magazine and can’t wait for it to arrive each month. It has such good information, lovely photos, and wonderful recipes. My favorite tea is Tazo Awake English Breakfast tea. I do take it w/milk or cream & a touch of Domino Light. I also love their Chai tea combined w/cinnamon creamer. That’s usually my afternoon or after dinner choice. I love to drink it on my patio while enjoying my flowers and the bunnies and squirrels in my yard. I light candles as the birds begin to settle down for the evening. Tea brings tranquility to me. I also like amber teas with lemon. I do like a strong iced tea with lemon in the summertime. I will definitely try the peach nectar ice cube idea! I love TeaTime, Victoria and all the special Bliss issues. Even though it’s not a Hoffman Media magazine, I also love Romantic Homes. All of these magazines are a delight to my eyes & inspirational for gracious living, which is so needed in our harsh world today. I love to go antiquing & find vintage linens with colorful handwork. I embroider, knit, crochet, do calligraphy, make jewelry and paint with water colors, so I have a great appreciation for all arts which are done by hand. Loved the Monograms issue! I also acquire vintage china tea cups (with pedestal feet!) when I go antiquing. I love crystal & pretty floral dishes, especially tea table items! My favorite antique shop has a special section with vintage jewelry. A week ago I bought a hand knotted necklace of pastel colors of jade-beautiful! Some of my best finds come from my church’s annual rummage sale! I wouldn’t miss it! So dear Phyllis, keep bringing God’s beauty and creativity before our eyes, it refreshes us and keeps us grateful! Many blessings to you, your family and staff! You and I have the same taste! I love it. I love Tea cold or iced. Im an avid fan of Tea Time magazine and Tea Time Bliss as well. I was lost when it stopped publishing for a while. Thank God it’s back. i too love tea…in fact whenever i’m having yet another cup my husband says “tea again” and i always answer with”tea is my life”….earl gray is also my favourite and i found one with lavender leaves in it…it’s heavenly!! Tea Time magazine is one of my favorite magazines. I have a special file that I keep them in. Was in a new tea shop today where I got Blueberry White Tea which I intend to make into iced tea. Have made it before and it is great. That sounds fabulous. Blueberry is a favorite of mine too! I am a tea lover & Earl Gray is one of my favorites. I especially like the flavored teas for summer; apricot mango is delicious. I have several tea pots & one of my favorites was purchased on a trip to Victoria a few years ago. Love reading all your comments. I too am a lover of Tea Time Magazine. Love having “my tea time” in the afternoon with my bone china. Used to collect Tea pots but since I’m almost 90 years old started giving them away to others in the family. Since coming to the Seattle area from Boston, Massachusetts many years ago I always put sugar and cream in my tea but when I became a Diabetic stopped adding to the tea. I like a good black tea and am not a lover of all these seasoned teas. Thank you for the recipe. I too love anything to do with tea. A few years back I bought “The Essential Tea Companion” book. What a lovely book. It has everything in it from how to brew a perfect pot, to selecting the pretty cups and the menus for afternoon tea. One of my favorite recipe is Cucumber-Basil Tea Sandwiches. I like the herbal teas and black teas. I love tea without sweeteners and lemon. Tea is truly heaven sent. What is it about tea and all of it’s romantic mystic? Earl Gray is my favorite as well, but recently my tea of choice is Lady Gray (Twining’s) which is a bit lighter, with citrus notes; perfect during the hot summer months. Whenever I am weeding in the garden and happen to brush against the bee balm/Monarda, the scent of bergamot fills the air and I suddenly feel the need for a break and a cup or tea. Thank you for your beautify publication! I have been a subscriber of Tea Time for years and look forward to every issue! I was born in Bristol, England and embrace all things British, Over the years I have shared wonderful memories with family and friends while enjoying a lovely cup of tea. I am an avid collector of bone china which I display throughout my home, so many of which are reminders of a special time spent with friends and family, The current issue of Tea Time was an exceptional one for me as the teapot on the cover is part of my collection, left to me by my Mum, I have the entire set; the teapot, cream pitcher and sugar bowl as well as four tea mugs, all of which I cherish, My sincerest thanks to all who bring us Tea Time! TeaTime is my favorite magazine that is published by your company! I first received it as a birthday gift subscription! I have saved all my copies! 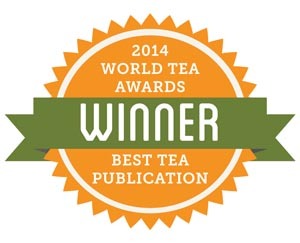 I treasure the recipes and especially enjoy all the Tea Rooms you highlight in each issue. I hope one day you visit Maids of Honour in Kew Gardens, England which has been in existence since the reign of Henry the VIII. I had the good fortune to visit twice with my friend, Stella Jones Leigh who has been my friend since our time together at a Emerson College in Forest Row, England! Tea Time Magazine is truly one of my favorites. That and Victoria. I am a tea lover, or should I say tea fanatic. I am drinking a cup of PG Tips right now. I drink tea what ever the temp is outside. I was raised in a New England Irish family, where tea was the main drink. I did not however start drinking tea until I was 30. I love putting on Tea parties and all such things tea. I was in charge of a Valentine Tea this past Feb. at my church. Everyone said they enjoyed it and learned alot about tea. I gave a talk on the history of tea, Tea Facts, and a devotional (not on tea). I have a huge collection of teacups and dessert plates to match. My absolute favorite is blue and white and have many, many of those in serving pieces as well as teacups and dessert plates and teapot. I have my grandmothers’ brown betty from Ireland. I usually like only different types of black teas, but also like a few herbal. 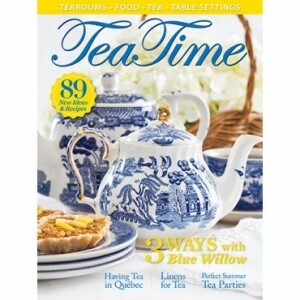 I was thrilled when I got my last TeaTime magazine and it was about blue and white. Of course I always look forward to the Victoria Blue and White issue. I am “steeped” in all things tea!